NEO coin is one of the most talked about cryptocurrencies in the crypto community and if you’re thinking of investing in it, before putting your money into the coin, you may want to gather more information about this cryptocurrency. This guide is going to drive into the NEO Blockchain. In this guide, we will cover the basics of the altcoin including what it is, NEO’s current value, NEO’s price history and how to invest in the NEO coin. 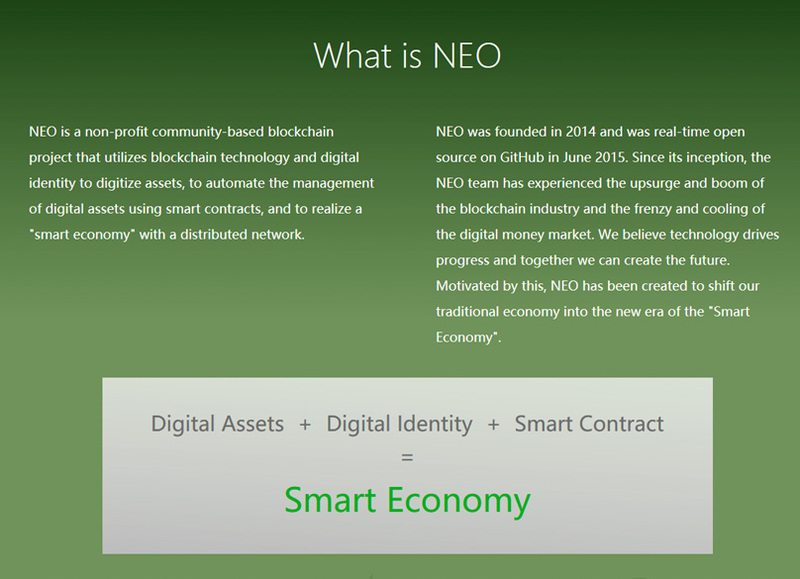 NEO is a non-profit, community-based blockchain platform and cryptocurrency designed to build a scalable network of decentralized applications to automate management of digital assets using smart contracts aimed at realizing a smart economy. As of writing time, NEO coin stands just below $7 with a calculating supply of 65,000.000 and a market cap of $381,276. So far, the coin has lost about 88% in price value from its all-time high. NEO was the first open-source blockchain technology developed in China. Soon after its launch, the Chinese government embraced it, making the most favourable coin by Chinese investors. NEO claims to an upper hand against other cryptocurrencies such as Ethereum as it offers better services making it favourite to users, investors and developers. According to some projections, NEO is said to reach a marketcap of $900,000,000 by 2020. By July 2017 when it got rebranded from “AntShare” to NEO coin, its price was about $6, which means a $100 investment in January 2017 would have yielded about $2700 by January 2018. This reflects a return margin on investment of 2600%. 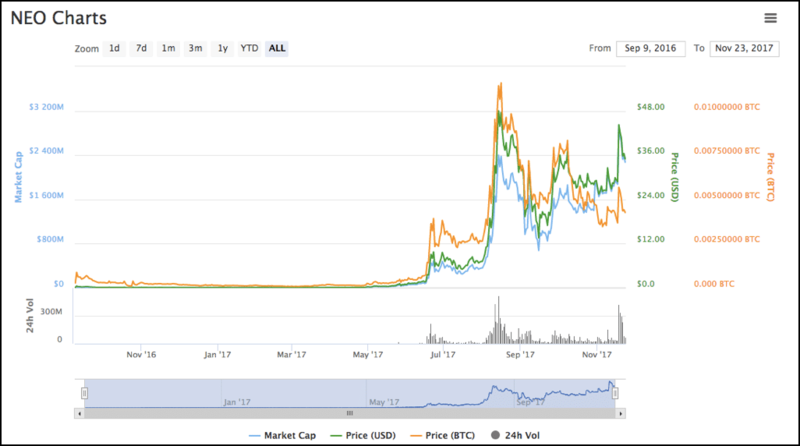 The price of Neo coin just like other major cryptocurrencies has since then seen a loss in price and value since the all-time high prices we saw in 2017. However, other coins saw even worst sell-offs at the beginning of 2018. Founded in 2014 by Da Hongfei and Co-founder, Erik Zhang, in its prime days in 2017, NEO emerged in top 10 cryptocurrency class in terms of market capitalization. The coin also prides itself of being one of the fastest and best handlers of transactions against most other cryptocurrencies. Over 4000 cryptocurrencies currently exist today with new coins coming into the crypto space every day, the current global market cap stands at $120 billion mostly dominated by the top 20 cryptocurrencies among which is NEO coin, often referred as the “Chinese Ethereum”. The coin has always prided itself by it’s non-divisible NEO token which generates GAS tokens that can be used to pay for transactions fees generated by applications on the network. NEO can be bought with the use of fiat such as GPD, EUR and USD through centralized exchanges like Coinbase. This exchange makes provision for clients to do fiat deposits which can be used to buy one of its supported coins like Bitcoin, Ethereum or Litecoin. Coinbase doesn’t support NEO coin, therefore, these coins can then be sent to exchanges such as Binance which support Neo coin. Centralized exchanges that deal in a variety of cryptocurrencies offer another way of owning NEO coin. Through these exchanges, as a customer you’re entitled to exchange one cryptocurrency for another crypto for a marginal trading fee. Furthermore, if you have ETH, BTC, LTC or USDT, you can exchange these for your NEO cryptocurrency. Since NEO doesn’t have a peer-to-peer embedded platform like LocalBitcoins it makes buying NEO coin with cash difficult. Even though that is the case, no third party can stop you from trading NEO in a peer-to-peer environment if you have buyers and sellers. With the absence of peer-to-peer service, it is not easy to find individuals who are interested in buying/selling the NEO cryptocurrency. However, always be on watch-out from scammers because escrowed services are not yet available for exchanging NEO coin. Coinbase is our recommended exchange for first-timers who have not invested before in cryptocurrencies. Coinbase is an American exchange which serves buyers from over 35 countries and they can buy cryptocurrencies with fiat. Ledger Nano S Wallet: As a hardware wallet type it supports cryptocurrencies such as BTC, ETH, BCH, ETC, LTC, DOGE, ZEC, XRP, DASH, STRAT, KMD, ARK, EXP, UBQ, VTC, VIA, NEO, XST, XLM and many more. For those looking for safety, Ledger Nano could be the best way to store NEO coins. This wallet is about 99% hack safe making it difficult for coins to be stolen. NEON Wallet: This is an open source cross-platform wallet with its desktop client nature. The wallet supports NEO coin, GAS, RPX, DBC and QLC. 03 Wallet: With its mobile type features it gives support to NEO coin, GAS and NEPS tokens. Atomic Wallet: a hardware desktop client wallet type with support to 280+ common once are; BTC, LTC, ETH, TRX, XMR, DGB, QTUM, XLM, ZEC, XRP, BCH, ETC, DASH, AWC, BTG, DOGE, TPAY, VET, VTHO, DCR. Holding NEO coins in some exchanges like Binance, could pose as a way for traders to make some extra passive income. However, never leave a large amount of NEO coins on any exchange as this could easily be hacked and stolen. Just like another financial digital investment, before you get through it, it is important to always consult a financial advisor before making any investment decisions and also don’t invest more than what you’re ready to lose. Bitstamp to handle Bitcoin tra.. The U.S DoS grants Levi Straus..
Hey there! I am Tobias Kumwenda, an IT bank professional turned into a Cryptocurrency and Blockchain proponent from Blantyre, Malawi. Cryptocurrencies and blockchain will change human life in inconceivable ways and I am here to empower people to understand this new ecosystem so that they can use it for their benefit. You will find me reading about Cryptonomics and eating if I am not doing anything else. Thanks for the powerful educative guide on NEO. I stumbled on it while searching on how to store NEO. Keep sharing more with us crypto business leaders.